Allocating LHENA’s money pot on Nov. 19th, 2014. The math didn’t add up. 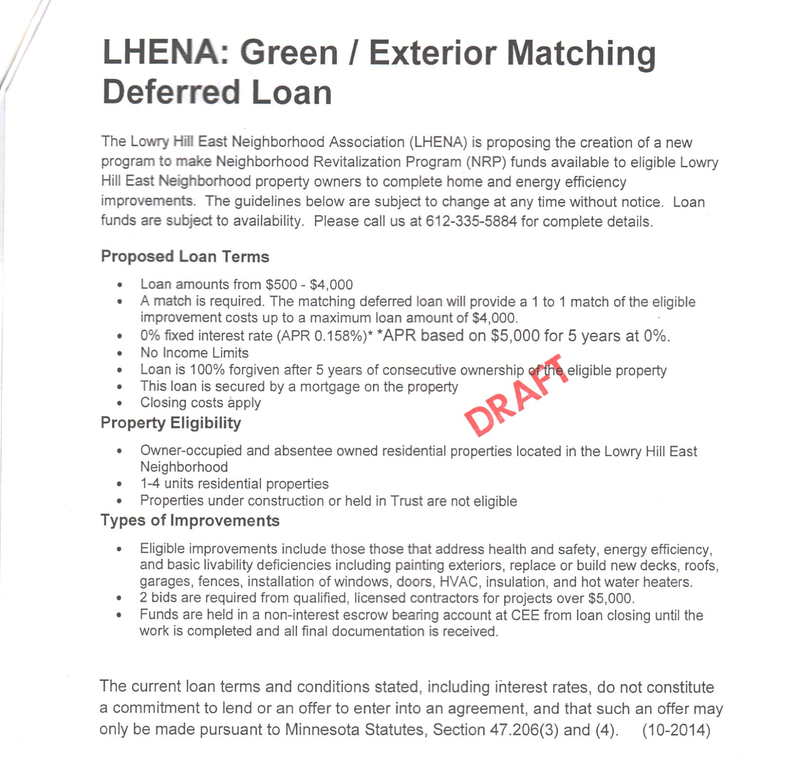 Three months ago, at a community vote, LHENA added need-based criteria to some unusually generous (forgivable) home improvement loans. The Healy Project faction of the Board was not happy with this change, which seemed like a good sign. According to a member of LHENA’s NRP Committee (speaking at last night’s Board meeting), last November’s changes have created a technical issue with the “exterior” loan. This particular loan has one set of terms for low-income property owners (forgivable), and another set for higher earners (not forgivable). As a result, the company servicing the loan says they can’t do it as written. You could solve this, says NRP Guy, by splitting the loans apart. It’s pretty simple: instead of one loan, you have two. This sounds like an easy fix to a technical problem. 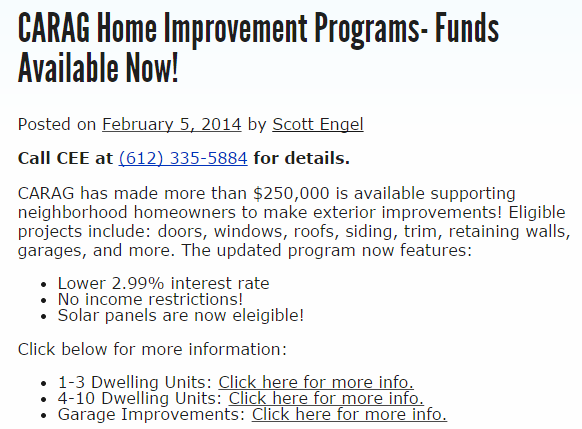 But I get the sense from NRP Guy that he’s got an issue with the spirit of last November’s changes to the loan program. As initially written, these weren’t loans; they were gifts. Three months ago, I made an argument for attaching the loans to financial need. To illustrate my point, I pointed to the 2400 block of Bryant Ave, with many homes approaching $500k, including one house that was selling for $1.2 million at the time (I should note the skepticism of Board Member Bill on this point, as well as the general tone from a few others that homeowners are victims of their 100-year old money pits). But last night, NRP Guy had a different take on the same neighborhood home price dynamic. He says the presence of all these $400k-plus homes means it’s too hard/impossible to target low-income homeowners for participation in the loan program. 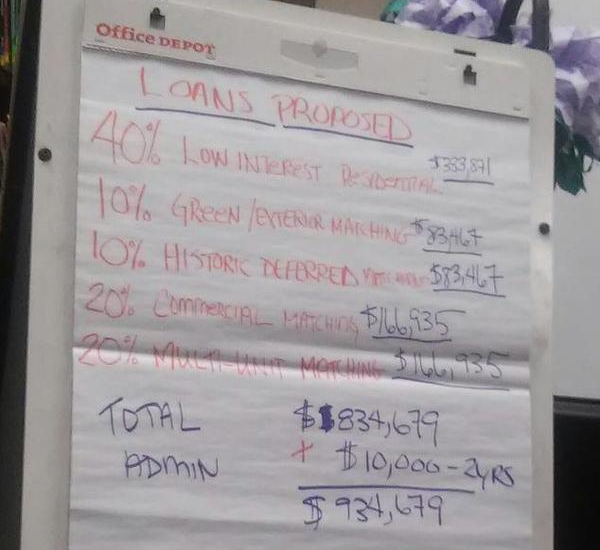 Maybe I’m willing to entertain that argument; but if it’s the case that Lowry Hill East has no needy homeowners, let’s move all these loans to 3% interest (including the 0% “historical” loan). The neighborhood directly to our south seems to think a 3% interest rate is a good idea. CARAG is offering three different “exterior” loans (those magicians split it into three! ), all at 3% interest. Bonus: when the loan isn’t forgiven, the money comes back and you can loan it again. I remain astonished at the eagerness of some people to give this money away (a few were so bent out of shape at the November meeting that you’d think the money was going straight to them and their friends). CARAG… more like CARAZY. I’d sooner let my Healy mansion rot than pay 3%. If LHENA wants to be generous, only make loans forgivable for homeowners in need. Deciding to own a difficult-to-maintain museum/house, or displaying a yard sign proclaiming your victimhood (IRRE-PLACE-ABLE) are both insufficient proof of financial need. Let’s not do this again.